Vinson says finding the baitfish can sometimes be key to relocating a school of quality fish. This entry was posted in Bass Fishing, How To Fish on May 31, 2013 by ronniegarrison. I purchased a Abu-Garcia Veritos medium action rod at an outdoor writers auction and teamed it with an Abu-Garcia Orra SXHS reel that I got at the same auction. Both were bought for well below the list price. I have had this rod for over a year and I like it so much and it has held up so well I bought another one this year. The reel was spooled with 12 pound P-Line monofilament line. The outfit is my favorite for casting big topwater plugs like a Lucky Craft Sammy. The Orra is a good match for this rod. The rod lists for about $100 and has micro guides. I had not tried these guides until I got this reel fearing they would not hold up and might be bad when using older line that had curled. But I have had no problems and those guides may help with casting distance. I can cast a Sammy a very long way, a big help when trying to reach schooling fish or fishing clear water when you want to stay well back from the area you are fishing. At a recent tournament a school of fish came up about 150 yards from the boat. I put the trolling motor on high and headed toward them as I picked up this outfit. I could reach them long before my partner could. I caught a two pound striper from the school before they went down, and it hit before my partner could reach them. The medium action on this rod is just right for casting a topwater plug and fighting a fish. It has good backbone but a light tip. The six foot, six inch length works well but you could get more distance with a longer rod. After over a year of heavy use and many fish caught I have not had any problems with the rod or guides. I did put a piece of pipe insulation in front of the reel and taped it since I hold a rod there when fishing, and it is much more comfortable with a cushioned grip. The open rod blank where the reel seats helps with feel and by gripping the rod in front of the reel, rather than palming it, I can easily pinch the line between my thumb and finger to have even better feel. This rod is a great addition to any fisherman’s arsenal and the price is low enough that it won’t break the bank, even if you buy several. This entry was posted in Fishing Product Reviews, Fishing Tackle on May 30, 2013 by ronniegarrison. Two bass fishing tactics are commonly used to pull big bass from massive grass mats: Throwing a hollow body frog for those fish willing to smash through the “roof,” and punching through the grass for those holding below. If bass aren’t hitting the top, the choice is already made. Put up your dukes and start punchin’. Endless grass mats make it seem like B.A.S.S. Elite pro Terry Scroggins is searching for a needle in haystack. With each pitch, Scroggins’ big weight hits the dense mat, punches a hole and pulls his Big Show Craw down beneath the grass. He lifts the bait a time or two to see if anyone is home, pulls the bait back out of the same hole and then pitches to another spot. The approach appears random, but Scroggins is highly intentional about his lure choice, the spots where he flips it and each presentation. A Florida-groomed pro with five B.A.S.S. wins and more than $1.5 million in career earnings, Terry “Big Show” Scroggins understands the idiosyncrasies of matted grass. He knows that bass live under those mats and that the best way to get them out often is to flip a heavily weighted bait so that it punches through the cover. Likely forage under a mat is a critical factor for Scoggins when he’s trying to decide which bait to punch. In Florida, crawfish abound beneath many mats, so his bait of choice often is his namesake Big Show Craw. Where bluegills are the main forage he’s more likely to use a YUM 2ube or Vibra King Tube. A compact creature-type soft plastic like the Wooly Bug is a blend of the two styles, and he often tries it first when he’s not certain of the preferred forage. Both professional anglers select dark colors for punching. The grass roof cuts light penetration so bass can’t see baits well, and dark colored baits provide a better silhouette. His two go-to colors are green pumpkin and black-and-blue. Other requirements for punching bass in the face include a heavy sinker (1 ½-ounce, often pegged), strong straight-shank or offset worm hooks, heavy action flippin’ rods and 60- to 80-pound braided line. Not all distinctions are visible from above the surface, but topo maps or GPS mapping and graphs reveal bottom breaklines, ditches, points and other features that may hold fish. Mason typically approaches mats of grass methodically, beginning along outside edges and then moving to scattered mats and eventually into the thickest stuff. He watches and listens continually for movement beneath the mats that suggests feeding fish and pays careful attention to every detail every time a fish strikes. Because mats commonly cover extensive areas, it’s critical to refine the pattern as a day progresses. Move quickly and make a lot of punches at a variety of locations until a fish hits, then slow down. Bass commonly congregate under mats, so an area that yields one bass often holds more. When one strikes, make your next pitch to that exact spot. This entry was posted in Bass Fishing, How To on May 30, 2013 by ronniegarrison. In last Sunday’s comic strip “The Lockhorns,” the wife and husband are getting out of a boat with fishing equipment in their hands. He has a very disgusted look on his face and his wife says “The fish weren’t dumb enough to go for that lure … but you were.” I know how he feels! I have said many times that fishing lures are made to catch fishermen, not fish. Walk into Berrys Sporting Goods and there is a bewildering array of plugs, spinnerbaits and worms in any color you can imagine, in many shapes and sizes. And I have a couple of most of them in my boat. Any lure will catch a fish. But does a fisherman really need all those different combinations? And why is a lime green plug better on any given day than a chartreuse one? It probably isn’t. But us fishermen keep hoping for some magic lure that will make us catch fish, no matter how or where we use it. Professional fishermen hype their favorite lures and colors constantly, and many have plug series and colors named for them. They have a vested interest in those lures selling. After all, the companies making them pay the pros a good salary or stipend. And every lure company is competing with others for the fisherman’s dollar. Don’t get me wrong. I have my favorites. And I keep trying new stuff that seems to come out every week. Some day that magic lure or worm color may be invented, but I doubt it. 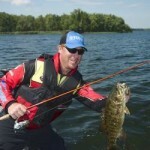 The place you use a lure and how you fish it is much more important than other factors. Other members of the bass clubs make fun of me since I normally have about 20 rods and reels on the deck of my boat, all rigged with different lures. It is much easier to pick up a different rod to try a different lure than to cut the one you are using off and tie on another one. That is, it is easier and quicker if you don’t have to untangle six rods to get to the one you want. I could probably have four rods and reels out to use in a tournament since I seldom fish more than four or five baits during a tournament. But I want to be ready just in case. In the last tournament I fished I used a spinner bait most of the day. I also fished a buzz bait, topwater popper, jig head worm and crankbait. But I had at least 15 more outfits ready just in case I wanted to try something else. A jig head worm, or shaky head, is pretty much my “goto” bait when fishing is tough. And I use one color of worm 90 percent of the time, switching to a different color only in real clear water. But I have over 100 bags of worms in different colors in my boat. Some day I may find one of those weird colors, like Tequila Sunrise, is just what the fish want. Bass eat a lot of kinds of food, but most are basic, subdued colors. I have never seen a bright red shad but I have bright red shad plugs. No orange worms exist in our lakes but I have bags of worms ranging from a dull, drab orange to bright, fluorescent orange. Sometimes when fishing a floating worm it helps me to see the bait if it is a bright color, and the bass will eat it, but why do they eat it? They don’t seem to care about the color at all. I often hear after a tournament that the bass would hit only a purple worm with a pink tail and gold flakes, or some such combination. But then you can talk with other fishermen that caught just as many, or even more, fish on a completely different color. And as often as not I have been fishing the purple pink gold worm all day without a bite on it! In any big tournament the pros do well with a wide variety of baits fished in a lot of different ways. 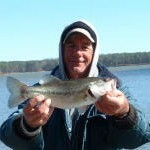 I fished at Hartwell on Wednesday with a fisherman that had won a tournament on Clark’s Hill the previous Sunday. He and his partner had five bass weighing 22.99 pounds and had big fish with a 7.8 pounder. He told me they caught them on a small crankbait and a white jerk bait. On Thursday I was at my boat club on Clark’s Hill and talked to a bass fishermen while we took our boats out. He said he was having a tough time catching bass but he heard about a tournament won on Sunday. The two guys were using a big crankbait and a chartreuse jerk bait and had 28 pounds, with a 7.8 pounder for big fish. After a little discussion we realized we were talking about the same tournament, but the weight had gotten heavier with the retelling. Funny thing, he had been using a big crankbait and chartreuse jerk bait all day without a bite. But he was fishing way up Little River where the water was stained while the tournament was won further down the lake in much clearer water. But he thought the winning fishermen had discovered what the bass wanted so he fished it all day. It was a little funny that he had heard almost the right info about the baits but was convinced enough to use those baits, even if they were the wrong ones. Us fishermen are crazy. So when you go to the store, be sure to pick up some of the newest, hottest lures and colors. The manufacturers and retailers will appreciate it. And the fish may even hit it! This entry was posted in Bass Fishing, Fishing Ramblings - My Fishing Blog, Fishing Tackle on May 29, 2013 by ronniegarrison. The Abu-Garcia Revo series of reels is one of the best on the market right now. The SX lists for $160 but I got mine for much less than that at an outdoor writers auction. I teamed the reel with an Abu-Garcia Veritas rod I love the outfit. I have six Revo reels and all have held up well to heavy use. The SX is extremely smooth and the drag system handles big fish. You can set the reel anti-backlash with an easy dial adjustment. With mine set at about half way, I can cast a 3/8ths ounce jig and pig on 15 pound Sun Line a very long way without any backlash problems. I can also pitch a jig easily at this setting. If I want to skip the jig I turn the magnetic anti backlash setting up a couple of notches to avoid the backlash. The reel is very light weight and low profile. Although I don’t palm my reels, I hold the rod in front of the reel for better control and hook set power, I like the low profile reel. And the black reel with red highlights is pretty on my white Veritas rod! Although the reel is fairly expensive, it is well worth the price. Abu-Garcia has a reputation for producing quality, durable reels and the Revo SX follows that tradition. This entry was posted in Fishing Product Reviews, Fishing Tackle on May 28, 2013 by ronniegarrison. What Are the Best Georgia Bass Lakes? Pity the poor bass fisherman in Georgia. There are so many good bass lakes around the state he just doesn’t know where to go. All the options make it tough to decide which way to head to catch bass. What a terrible problem to face! From our beautiful mountain lakes with steep rocky shorelines, clear water and aggressive spotted bass to flatland reservoirs full of stumps, grass and largemouth, we have it all. Good fishing will always be within a short drive of a Georgia bass fisherman. And it is always fun to take a trip to a lake on the other end of the state to try something completely different. Any lake in Georgia will produce good catches but how do you decide which lake to go to if you want to improve your odds? A good pointer is the Georgia Bass Chapter Federation Creel Census Report compiled by Dr. Carl Quertermus at the University of West Georgia. He has been crunching the numbers reported by Georgia bass clubs since 1978. His data can give you an excellent guide. First, you need to decide if you want to catch big bass or numbers of bass. Although you can do both at times, some lakes will always produce bigger than average bass but they usually produce lower numbers per angler hour. Others will consistently produce more bass for you but their size will not be as good as on other lakes. The following lakes will give you some good choices. You won’t go wrong with any of them, no matter what your bass fishing goals. Lake Thurmond, better known at Clark’s Hill to Georgia fishermen, is by far the most popular destination for state bass clubs. There were 125 tournaments reported there during the most recent creel census annual report. The next most popular lake, Sinclair, had 76 tournaments reported. There is a reason Clark’s Hill is so popular – it produces excellent numbers of good size bass. The average catch rate per man hour of bass fishing there was .306, meaning it took just over three hours to produce a keeper. That doesn’t sound great, but it is the third highest catch rate in the report. Since there are so many tournaments there that is a lot of bass. The average size of bass from Clark’s Hill is 1.77 pounds, not huge but the second highest for a lake with a 12 inch size limit. And there are good numbers of five-pound plus bass in the lake. It took 225 hours of fishing to produce a bass over five pounds, second shortest time in the state. A few spots are showing up in Clark’s Hill and may hurt the fishing over the long run, but right now the numbers and size of bass make Clark’s Hill one of our best lakes to fish. Dammed in 1950, Clark’s Hill is our biggest lake with 72,000 acres of water covering the Savannah and Little River basins just north of Augusta. It is the last of the chain of lakes on the Savannah and the terrain the lake floods is rolling hills with creek and river channels. The lake is big enough to offer just about any kind of fishing conditions you want, from very clear to muddy water, deep drops to shallow flats and even hydrilla to fish. The hydrilla is a fairly new addition to the lake as are blueback herring. Both have changed the lake. The hydrilla offers extensive heavy cover where little existed fifteen years ago and the blueback have become a favorite food for the bass. When the bluebacks are spawning in April you can catch large numbers of quality bass throwing big topwater plugs like a Zara Spook, soft jerkbaits like a Zoom Fluke and wake baits like the Buckeye Lures Wakeup over shallow gravel flats. The Georgia Little River arm of the lake is excellent for this, with many blow-throughs, shallow gravel bars between islands, where the blueback spawn. After the sun gets bright and the blueback disperse, dragging a Carolina rigged lizard on gravel flats and points produces good catches. On bight sunny days pitching a jig and pig into holes in the hydrilla and popping it back can produce quality bass. And, if the lake is full, dropping a Texas rigged worm around button bushes in the shallows if a fun way to catch fish. The lake with the highest catch rate in the state is always a surprise, but Lake Allatoona consistently holds that position. Although the number of tournaments there is low, they produce a catch rate of .352, the highest in the state. 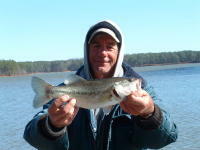 Allatoona has been consistently in the top lakes in the state for numbers of bass per hour for several years. Size of bass is good, too, with the average bass weighing 1.75 pounds. But it is tough to catch a five pound plus bass. None were reported in the most recent creel census report. Since spots account for 90 percent of bass weighed in, that is not surprising, and a 1.75 pound average for spots is impressive. Located almost in downtown Atlanta, Allatoona gets real crowded and is hard to fish during the warmer months, except at night. Just over 12,000 acres of water cover steep rocky hillsides and flats up the Etowah River. Filled in 1950, it is just 30 miles north of Atlanta and I-75 crosses it. The lake is full of spotted bass and the steep rocky banks and points are great habitat for them. The lake is small enough that water levels change rapidly. A heavy rain will over-fill the lake but it will be pulled down just as fast. And the average 17 foot drop for winter pool means there is not much shallow cover except rocks and man-made brush piles. 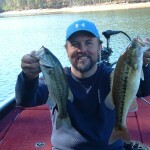 Your best bet to catch spots on Allatoona is to get on the rocky bluff banks and fish them. You can parallel them with a crankbait while the water is still cool, keeping you boat in close and running your bait along the steep drop. Hopping a jig head worm or small jig and pig down the rocks also works well. Topwater early in the morning fished along the steep rock walls will draw strikes until the sun gets on the water. From big baits like a Spook to small ones like a Tiny Torpedo, spots will hit topwater hard. Some days they want a small bait, sometimes the big one, so give them a choice. As the water warms ride points, humps and channel drop and watch your depthfinder for brush piles from 18 to 30 feet deep. Mark them, back off and drag a jig head worm or jig and pig through them. On the more shallow ones run a big crankbait over them if you can get it down to within a couple of feet of the top of the brush. It is even better if you can tick it. Often overlooked by bass fisherman, Blackshear has the highest average size for largemouth of all lakes in the Creel Census Report, at 2.26 pounds. There aren’t a lot of tournaments reported on the lake but that average size is impressive. And it takes only 261 hours to catch a five-pound plus bass, third lowest time in the state. Numbers of bass caught is what often holds fishermen back from going to Blackehear. It takes about six hours of club tournament fishing to produce a bass, the longest time in the state, but the size is likely to be good. And the cover you get to fish makes Blackshear a fun lake to fish. Located near Cordele not far from I-75, Blackshear is in the middle of the state. Its 8500 acres on the Flint River cover swamps and bottom land and the lake is very shallow. Dammed in 1930, it is a very old lake but it was drawn down in 1973 and much of the standing timber was removed from the main lake below the Highway 280 Bridge. The flood in 1994 broke the dam and it was rebuilt, renewing the lake for few years. If you like fishing cover for largemouth you will love Blackshear. Its shallows are filled with cypress trees and various kinds of aquatic grass. Bass hold tight to this cover but it is fun fishing visible targets rather than dredging unseen depths. Pitch a Texas rigged plastic worm or jig and pig to the base of a cypress tree and let if fall. Work it slowly through the root ball. Remember the roots of a cypress often extend several feet from the base of the tree and bass will hold anywhere in them. A key to fishing cypress trees is to hit the trunk of the tree and let your bait slide into the water. A splash seems to turn off the bass holding so shallow. Use heavy tackle. You are likely to tangle with a two to five pound bass in this thick cover. If you like topwater, the grass filled shallows are fun to fish, too. Use weedless baits like a frog or rat and work matted vegetation. You can also run a buzzbait over submerged grass, through holes and channels in grass and beside cypress trees. All methods will produce water splashing strikes. The best bass lake in Georgia for big bass should come as no surprise. Seminole has long been known as the land of lunkers and the Creel Census Report shows it still produces the best fishing for quality bass in Georgia. It is well worth the trip south to experience its fishing and beautiful scenery. It has a few spotted bass in it and shoal bass can be caught in the rivers, but largemouth are the main species. The average size of bass at Seminole is a respectable 2.1 pounds, highest of any lake in the state with a 12 inch limit. And the amount of time it takes to land a lunker over five pounds is only 131 hours, by far the shortest time of any lake in the report. The catch rate is pretty good with a keeper bass landed in less than five hours of fishing, too. In the far southwest corner of the state, Seminole is bordered by Florida and Alabama but most of its waters are in Georgia. The dam was authorized in 1946 on the Apalachicola River just south of where the Flint and Chattahoochee Rivers join. It backs up 37,000 acres of very shallow water. Seminole is full of standing timber, stumps, grass beds and shallow bars. It is dangerous to navigate and visiting anglers need to stay in marked channels when running. Locals run across unmarked flats and lower unit sales are brisk in the area. The rivers get stained to muddy pretty fast from upstream rain but Spring Creek and Fish Pond Drain stay clear most of the time. Those areas offer great sight fishing for bedding bass in the spring and many tournaments are won using that method. It is exciting to be looking at a five pound plus bass and trying to make it hit. Hydrilla fills the lake and bass live in it most of the year. You can fish it by running topwater baits over submerged beds, running crankbaits down the edges of the grassbeds where channels cut through it, or by dropping plastic worms or a jig and pig into it and working through it. Standing timber also holds bass and many are caught on drop-shot worms jiggled at the base of trees standing on the edges of old channels. You can also work the edges of the timber with a big crankbait or spinnerbait, or fish a Carolina rigged worm by throwing into the trees and working it out. The key to catching bass in timber is to find a change in the bottom. A hump or a channel will hold bass along its edges. For something different, run up the Flint River above Bainbridge to the rocks and shoals. Many fishermen use jet boats because it is so dangerous, with big mid-river rocks that will ruin a lower unit, but you can catch some big shoal bass on crankbaits and plastic worms in the shoals. Five pound plus shoal bass are possible and one that size is a real trophy. Fish any of your baits with the current. You will need a strong trolling motor to hold you in the shoals to fish where the big shoalies live, and it is dangerous getting to them, but the fishing can be like no other fishing in Georgia. 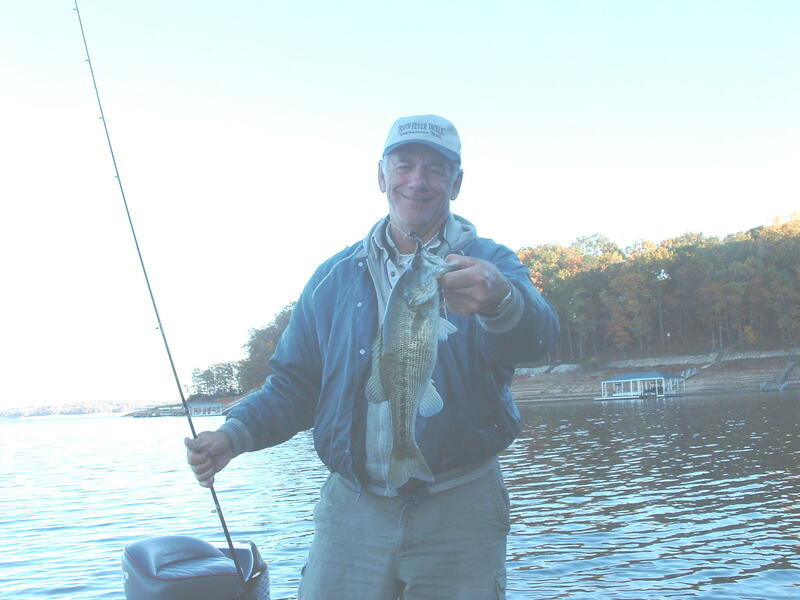 West Point is a popular lake with both bass club fishermen and other bass fishermen. It has changed a lot and spotted bass have largely replaced largemouth in most club tournament catches. For this reason the average size of bass caught is not very high. A 13 inch spot will not weigh nearly as much as a 14 inch largemouth. You can keep any size spot at West Point but largemouth must be at least 14 inches long. The numbers of bass caught at West Point is third highest in the state at .303 per hour, but the average size is only 1.53 pounds, third lowest in the state. And it takes a whopping 743 hours to land a five pound plus bass, second longest time in Georgia. 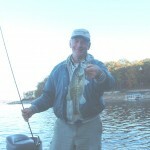 West Point is fun to fish because it is so varied and you can catch a lot of bass there. Located just west of LaGrange on the Chattahoochee River, its 26,000 acres are backed up by a dam built in 1974, making it one of our newest lakes. Rolling hills and deep channels mark the lower lake while extensive flats and river like banks are filled with bass upstream of the railroad bridge. 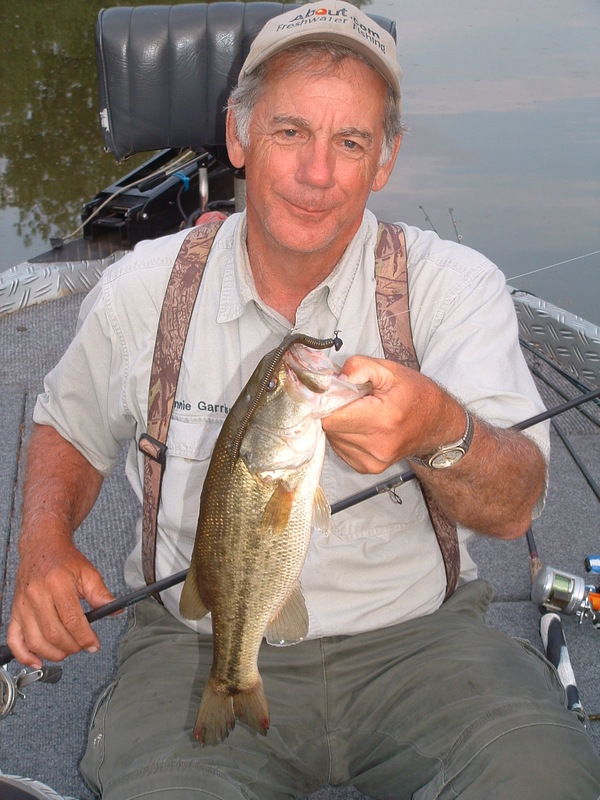 Spotted bass abound on the gravel and rock flats and points on the main lake. Crawling a jig and pig across them or dragging a Finesse type worm on a Carolina rig is a good way to catch them. Spots fight hard and are fun to catch. They are also very tasty and fishermen are encouraged to keep up to their limits of ten bass per day of any size spot landed. Removing spots from the lake probably won’t help much at this point, but it surely won’t hurt anything! For largemouth, fish blowdowns and brush piles on the lower lake with a big Texas rigged worm or Senko. Fish the slowly and give a big largemouth a chance to hit it. Also run up the river and work big baits through the numerous blowdowns that line the steep river banks. Many tournaments are won up the river since it tends to produce bigger fish. Pick any of these lakes or just go to the one nearest where you live. You are going to catch bass in Georgia on all our lakes, but these give you some advantages, depending on what you want. You can’t go wrong with any of them. This entry was posted in Bass Fishing on May 28, 2013 by ronniegarrison. The rod is sensitive and has good feel for the jig bumping rocks and wood. I can also detect strikes easily. The medium heavy rod has great hook setting power and the seven foot length helps get a good hook set. The one op piece rod is light enough that I can fish with it for hours without fatigue. The one drawback for me is that there is no comfort cushion in front of the reel. I hold my casting rods and reels by gripping the rod in front of the reel. I do not palm the reel since I think I get more control holding the rod, and I can let the line run between my fingers while fishing. Without a cushion of some kind it is very uncomfortable so I sipped a six inch piece of pipe insulation on the rod, got it in place and taped it with electrical tape. That works well for me. Since the rod has the rod blank exposed just below the reel, my palm rests against it and that increases the feel. This is a good mid-range price rod and the two I have are some of my favorites. This entry was posted in Fishing Product Reviews, Fishing Tackle on May 27, 2013 by ronniegarrison. If you ask most bass fishermen how to catch suspended bass, don’t be surprised if the response is: “you can’t.” Suspended bass present fishermen with one of the most difficult problems to solve and many just give up and go look for easier fish to catch. But there are ways to get them to bite and tactics that will help you land fish that others give up on. Bass suspend away from structure and cover for a variety of reasons. One of the most common is when lakes stratify, forming a thermocline between hot upper oxygenated layers of water and cooler, deeper layers with little oxygen. Bass can’t live in the cooler waters so they get as close to it as they can, suspending over deep water at the level where they can still find enough oxygen. Suspended bass will often be found holding off points and humps at the most comfortable depth to them. They will be over a deeper channel but not far from the rise in the bottom where it meets the depth they are holding. That allows them to run in and feed, then move back out over deeper water. Some lakes present a special situation where standing timber under the water rises many feet off the bottom. Bass will often use these trees as cover, relating to the trunks and limbs while holding well off the bottom of the lake. The best way to find suspended bass where you fish is to ride the lake and watch a depth finder carefully. Follow channels and ditches while watching for fish holding between the bottom and the surface. Riding back and forth over a point or hump, not turning your boat until well past the drop of the bottom contour, will show you schools of bass suspended near them. And moving slowly over standing timber will reveal bass suspended in it if your depth finder is a good one. Depth control of your bait is critical to catching suspended bass. They are holding at a set depth and will not move far up or down to take a bait. So finding the bass and knowing what level they are holding is just the first step. You must then find a way to put your bait at the level where they will see it. A crankbait is a good way to catch suspended bass but you must make it work at the dept the bass are holding. There is an old tried and true method of doing this that has fallen out of favor. Trolling it a great way to get your crankbait down to a set depth and keep it there while covering a lot of water, but it is against the rules in bass tournaments so many bass fishermen have abandoned it, but it still works. Most lure companies have designed a variety of crankbaits that run down to a set depth. For example, a Bandit Series 400 will run 12 to 16 feet deep and a Series 700 will run 14 to 18 feet deep. A Bomber Fat Free Shad will run 14 to 18 feet deep while a Fat Free Fingerling will run eight to 10 feet deep. The depth varies depending on factors like trolling speed, line size and amount of line out, so you need to experiment to find out the exact combination to produce the exact depth you want. Mark a set depth on a point then troll over it varying line size, length of line out and trolling speed until your bait just ticks the bottom at the depth you want it to run, then troll through schools of bass at that depth. You can do the same thing if you are limiting yourself to casting, but line size and the distance you cast are even more important. And boat position becomes critical. When you cast a crankbait like the Bomber or Bandit it will dive to its maximum depth as you start your retrieve then rise when it gets near the boat. Since your crankbait will stay a the desired depth for only a short distance when casting, you must locate the schools of bass then position your boat near them so you can cast past them and work the bait back, keeping it at the critical depth as long a as possible. Some newer baits on the market make casting and controlling your depth easier. Both the Swarming Hornet and the Fish Head Spin are lead-head baits with a small spinner under the head. When you attach a Roboworm E-Z Shad or other shad looking plastic bait, it imitates a baitfish. Tie on one of these baits and vary the weight of the lure and the line size to match the conditions like wind, water clarity and depth you want to fish. Smaller diameter line helps keep the bait at the depth you want to fish and you can get by with lighter line since the bass are away from cover. Position your boat near the school of suspended bass and make a long cast past it. Feed line to the bait as it falls so it drops straight down and count it down. Figure one second per foot of drop, but to be more exact cast to a known depth and count it down to make sure your are accurate. When the Fish Head Spin or Swarming Hornet reaches the correct depth, slowly reel the lure along. A slow, steady retrieve keeps the spinner turning and keeps the bait at the optimum depth. You can cover much more water at the best depth with one of these lures than with a crankbait since the lure drops straight down to the correct depth then stays at that depth all the way back to the boat. One of the easiest and most effective ways to control the exact depth you want to fish is by using a drop shot rig. A drop shot rig is one where the lead is tied to the very end of your line and a hook tied on up the line. Special hooks and sinkers are designed for drop shotting and make it a more efficient way to fish, but you can use any sinker and hook as long as the hook is very sharp. Gamakatsu hooks are known to be super sharp and they make a Drop Shot/Split Shot hook that comes in a variety of sizes and you can choose red or black hooks. These hooks are relatively small and are perfect for nose hooking small plastic bait like a Slider Worm, Roboworm or Gulp Minnow Grub. A soft, straight worm like the Slider or Roboworm is the usual choice for drop shotting, but experiment with other shapes of baits, too. Some days the bass might like a fat Gulp Grub with a quivering curly tail over a thin straight worm. Choose one of the plastic baits that match the size of the baitfish the bass are eating, and use a color based on water color. Clear water is usually best for drop shotting so line choice is critical, too. Fluorocarbon line is the standard for drop shotting and Sunline is invisible in the water and holds up well. The lack of stretch of fluorocarbons like Sunline also help with hooking fish on light line. You can drop shot at any depth you find the fish holding. If they are three feet off the bottom, tie your hook three feet up the line. If they are 15 feet off the bottom, tie your hook 15 feet up the line. This may sound strange but, since the sinker is at the end of the line, when you hook a bass and reel it in, there is nothing to get in the way of landing it. You may have a lot of line trailing the bass but you can land the fish without reeling it all in. Get your boat right on top of the school of bass and hold over them watching your depthfinder. Let the sinker on your drop shot rig hit the bottom and you know your bait will be at the exact depth you tied it above the sinker. Twitch your rod tip, making the worm or grub dance right in front of the bass’s mouth. Drop shotting is the best way to catch bass suspended in timber, too. For these bass, tie a hook a few inches to a foot above a sinker and get right on top of the fish. A good depth finder will allow you to watch your bait as it falls and you can stop it right in front of the bass and shake it. You are usually targeting a single bass in timber rather than a school. A drop shot rig moves the sinker away from the bait while still giving ou exact depth control. Don’t let suspended bass ruin your day. Try these techniques to land them when others are just shaking their heads. This entry was posted in Bass Fishing, How To on May 26, 2013 by ronniegarrison. Along its 170 mile course the Oconee River passes through some beautiful country, from its hilly beginnings north of Athens to the flatlands where is joins the Ocmulgee River near Lumber City. 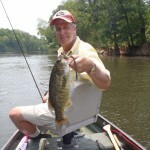 But to bass fishermen none of the river is it prettier than the 45 miles contained in Lake Oconee and Lake Sinclair. Oconee and Sinclair offer some of the best bass fishing in Georgia, especially in the winter. Although the lakes are back to back with the Oconee dam separating the two, and have many similarities, they are different in many ways. Those differences and similarities are important to the bass fishing on each. Lake Oconee is the newer of the two and its 19,050 acres of water was dammed in 1979. It has 374 miles of shoreline covered with golf courses, expensive houses and docks. There are areas of huge boulders in parts of the lake and natural rock is common. Shallow sandy coves and clay points are found throughout the lake as are big areas of standing timber. Lake Sinclair is smaller and older than Oconee, with 14,750 acres of water. It has more long creeks so it has slightly more shoreline with 417 miles. Although work on the dam was started in 1929 the Great Depression and World War II stopped it and it was not completed until 1953. There are many sandy coves and shallow creeks with extensive grassbeds, but no standing timber. Some natural rock is in the lake but you won’t find the big boulders common at Oconee. Like Oconee, it is lined with docks. Lake Sinclair has always had a 12 inch size limit on bass but at Oconee there is a slot limit from 11 to 14 inches, meaning you can keep bass over or under that length. 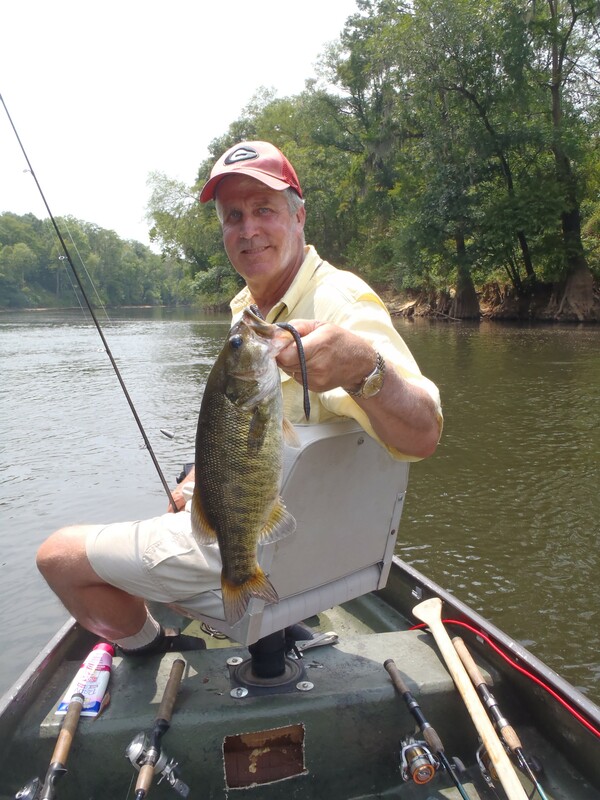 That was done to try to keep down the population of small bass since Oconee is not a fertile lake, but fishermen seldom keep the smaller bass so the slot limit may not be very effective. Both lakes have a ten bass daily possession limit. Water clarity is similar on both lakes and ranges from very muddy to slightly stained. The upper Oconee River at Oconee is most likely to be muddy while Little River on Sinclair stays heavily stained year round. The clearest water on Sinclair will usually be in Island and Rocky Creeks near the dam and Richland Creek on Oconee is usually the clearest. Sinclair also has a steam power plant that warms areas of the lake, keeping winter temperatures well above those at Oconee in some sections. At the Oconee Dam the power generators were specially designed to work as pumps, too. During the day water runs through them from Lake Oconee into Lake Sinclair, producing electricity. At night some of the generators are reversed, pumping water from Sinclair back into Oconee. This pump-back operation creates unusual current patterns on both lakes and affects the bass fishing. When power is being generated at the Oconee dam current runs downstream through Lake Oconee and Lake Sinclair. But when water is being pumped back the current flows upstream in both lakes. This current positions bass in different ways on structure and cover. The pump-back operation does keep both lakes at a fairly stable water level. Oconee will drop a foot or two during the day and Sinclair will rise the same amount, then Sinclair will drop a foot or two at night while Oconee rises. But the water does not show the drastic drops found on other Georgia lakes in the winter, with both lakes staying within a couple of feet of full pool most of the time. 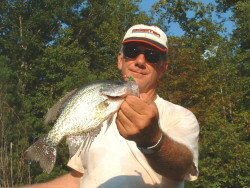 According to the Georgia Bass Chapter Federation Creel Census Report, in 2007 Sinclair had 81 tournaments and Oconee 73, the second and third highest totals of any Georgia lake. A lot of tournaments are held on the two lakes because fishing is good on them. On Sinclair 2.91 bass per man hour of tournament fishing were weighed in, the highest in the state. At Oconee it was 1.88, not real high but tournaments have an effective 14 inch size limit that lowers the numbers weighed in. For tournament winning weights Oconee and Sinclair had identical 9.83 pounds, tied for fourth highest in the state. So bass fishermen catch a lot of bass in tournaments on both lakes. The numbers are good and success rates reflect this, meaning you should catch a good number of bass on either lake this winter. The Georgia DNR says Sinclair has a lot of small bass in it, no surprise to anyone fishing it, and the good 2006 and 2007 year class bass should dominate this winter. Since over 90 percent of bass caught at Sinclair are usually released the numbers should stay high and the size increase with time. At Oconee the bass population is stable but the DNR is concerned that the numbers of small bass will hurt the lake. Unless bass fishermen start keeping the small bass under the 11 inch slot limit the quality will suffer. That may be reflected in the fact the average big bass in tournaments at Oconee was only 3.68 pounds, compared to 4.20 pounds at Sinclair. There are a lot of ways to catch bass on both lakes right now. You can follow the same patterns on each or specialize on patterns that work best on one lake or the other. Fishing docks is a good winter pattern on both lakes. Find a dock near deep water and flip a jig and pig or curly tail worm to the pilings and brush around it and you should get bit. On both lakes pay attention to the current. Strong currents are not as good in the winter but a slight current moving water under docks helps. The bass will hold behind post and brush, facing into the current waiting on food. Position your boat downstream of the current, no matter which way it is flowing, and flip upstream, working your bait back in a natural action. Crankbaits also work well around docks in both lakes. A #5 or #7 Shadrap run by dock pilings will draw strikes from winter bass. Natural colors like shad or black and silver are good. Just like with the jig and pig, fish with the current. Run your crankbait at a slow, steady retrieve, going slower in colder water. On Oconee the docks from Long Shoals Ramp up to the Highway 44 Bridge are good. Stay on main lake areas where the docks are deeper and concentrate on outside posts and brush this time of year. Work your jig and pig or worm slowly in the cold water, dropping it to the bottom and jiggling it in one spot by a post. At Sinclair the docks in Beaverdam Creek are good since the warm discharge from the steam plant keeps the water warmer. There is almost always some current here, too. The discharge from the steam plant moves water even when there is no current from the dams. Also try the docks from Beaverdam Creek to the dam. If the water is muddy go into Rocky and Island Creeks and flip docks in clearer water. Riprap is excellent on both lakes in the winter. A spinnerbait slow rolled just over the rocks, ticking them as it eases along, it a good choice. Fish it with the current. Crankbaits are also good. Use different sizes to reach different depths. For five-foot deep rocks cast a #5 Shadrap but go to a #8 Shadrap for rocks down to ten feet. Fish all sizes with the current, reel them down to the desired depths then crank them in slowly. At Sinclair there is almost always current around the rocks at the Highway 441 Bridges and the one in Beaverdam Creek has the added advantage of warmer water. Also check out the riprap around the steam plant outflow in that creek. The riprap at Crooked Creek can be good and riprap around houses and docks on points on the main lake often holds fish, especially if the sun is warming it. On Oconee the bridges in Lick Creek area always good as is the Highway 44 Bridge over the river. You can catch fish on the I-20 riprap up the river, too. Many of the houses on the main lake have riprap protecting their shoreline. Riprap in front of a seawall that drops into deep water is best. Current is the key and the bass bite much better when some water is moving across the rocks. Both Oconee and Sinclair have a lot of long points and humps on the main lake that are good places to jig a spoon in cold water. Bass stack up in deep water and hold there all winter long A shallow point or hump with a good drop on it is an ideal place to find a school of bass. Most are near creek and river channels. Jigging a spoon works best in clearer water. You can locate schools of baitfish with bass under them with a good depthfinder then get right on top of the school and drop a spoon. Mark them with a buoy to you can stay on them. Drop the spoon down to the bottom, pop it up about two feet and let fall back on a tight line. Vary the height you pop it up and the speed of the pop until you find what the bass want. In both lakes hard bottoms are best. Sand, clay or rock hold more fish so look for these type bottoms no the humps and points. Sometimes bass want cover like a brush pile, stumps or rocks but usually they will be on slick bottoms this time of year on these points and humps. On Oconee the humps and points from the dam up to the mouth of Richland Creek are good. You can also find fish on up Richland Creek and up the Oconee River if the water is clear but the best spots in the River will be from Lick Creek downstream and in Richland Creek from Sandy Creek downstream. Look for the bass to be holding in 18 to 22 feet of water most days. At Sinclair the long points and humps from the mouth of Little River to the dam are good and there are some excellent points in both Rocky and Island Creeks. If the main lake is heavily stained concentrate your efforts in the creeks. Bass tend to hold a little deeper in those areas at Sinclair so look for them 18 to 25 feet deep. Even on the coldest days some bass will be shallow in both lakes. If the sun is shining it will warm the backs of coves and pockets and bass will feed in them. Find a short cove with a good channel running into it, with shallow flats in the back, and the bass will be there looking for something to eat. Crankbaits and spinnerbaits are good bets to catch them. On Sinclair look for shallow flat pockets on the west side of the lake around Nancy Creek to the dam. Some grass in them helps. Throw a Rat-L-Trap or #5 Shadrap up very shallow and work it back just fast enough to bump the bottom. Also slow roll a spinnerbait along the bottom. Hard sand or clay bottoms are best. On Oconee there are good pockets from the mouth of Lick Creek to the dam. A pocket that gets sun most of the day is better and grassbeds helps, although there is not a lot of it on Oconee. Although the grass will be dead baitfish still feed on it and they attract bass. A spinnerbait worked along the bottom is an excellent bait for these bass. Sinclair has a lot more grass than Oconee and the pattern of fishing grass is better there. Most of the coves and creeks from Crooked Creek to the dam on the Oconee River have some grass beds in them. Fish a spinnerbait around them and let the bass tell you if they are holding in the grass or on the edge. Once you establish this pattern you can find similar places in most coves. 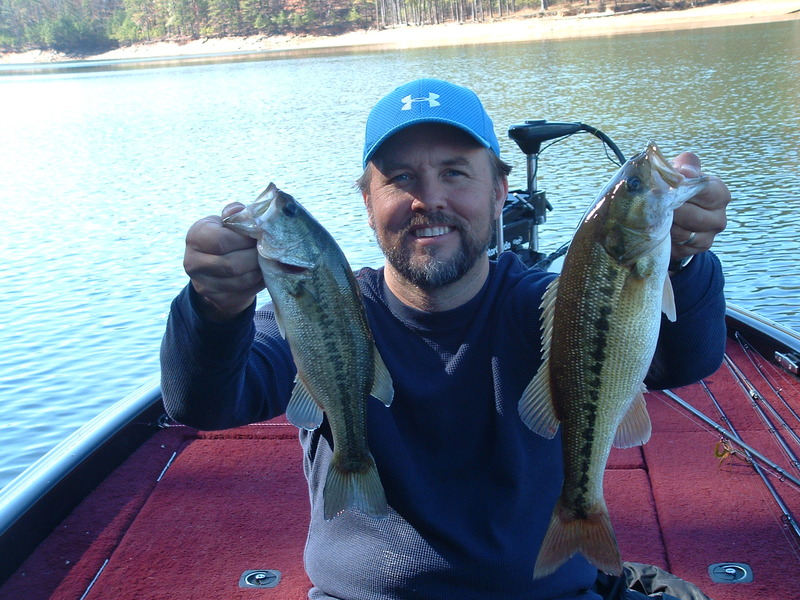 Standing timber can be a place to catch winter bass at Oconee but Sinclair does not have it. The timber that runs for a long way on both sides of the point between the Oconee River and Richland Creek as well as the patches of timber in Double Branches are good. You are more likely to have current on the main lake timber on the point than in the patches in the creek. There are several ways to fish the timber. Bass sometimes suspend in the branches and you can catch them on a crankbait or spinnerbait fished through them. Make fairly short cast with either bait and get them down to about ten feet deep. Bounce them through the limbs and off the trunks of the trees. Vary the depth until you catch a bass then concentrate on that depth. Also pay attention to which tree the bass hits. Is it on the outside edge of the patch of timber or on the inside edge. Or is it in the middle of the patch. If on the edges concentrate on them but if inside the timber fish every tree. You may also be able to tell what kind of tree it is and whether it has underwater branches. An old cedar tree will have more branches than most others. If you are hitting a lot of branches when you catch a bass try to find trees that have a lot of them to fish. If the fish don’t want a bait moving through the trees, try dropping a jig and pig down the trunk. 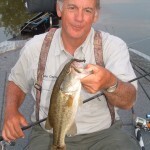 A light jig and pig with a twin curly tail trailer will fall slowly and draw a bite. Fish it on heavy line and set the hook hard if you see a twitch or jump in your line as your bait falls. If it stops falling before getting to the bottom be ready to set the hook, a bass probably has it. Don’t pass up jigging a spoon along the creek channels and ditches in the timber, too. Bass will often hold right on the bottom on the lip of the ditch by the tree. The best way to get to them is to drop a spoon down and jig it vertically. Start at the back of the pockets of timber in Double Branches where the channel enters the trees and work deeper, or work the outside of the trees along the channel in Richland Creek. Any change in the bottom, like two ditches coming together, a big rock or a hump, will help hold bass. When you find the best depth concentrate on it. Spend some time on Lake Oconee or Sinclair this winter. Even if you are cold, the bass will make it worth your time. This entry was posted in Bass Fishing, How To Fish on May 25, 2013 by ronniegarrison. What Are Some Good Baits For Fall Bass Fishing? Die hard bass fishermen love the fall. We would much rather be on the water trying to fool a bass than perched in a tree waiting on something with horns to wander by or sitting in front of the TV watching guys play with a ball. Fortunately, many of our less fanatical bass fishing brethren like those other sports so we don’t have to share the honey holes with as many other fishermen. Add in the lack of pleasure boats, jet skis and skiers and fall fishing is almost heaven.